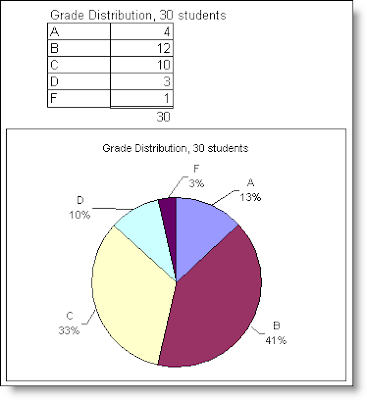 Now go back to the first cell (A1) and add the following formula: ="Grade Distribution, " & B7 & " students"
To recap, it is the Series Name field in a pie chart that also serves as the Title. The Series Name field can be entered manually or refer to any cell, and the cell may contain a formula. This same technique will work for Column, Bar, and Line charts as long as your are only looking at one set of data (like you do with a pie chart).